Cabinet water-curtain style dust suppression system. 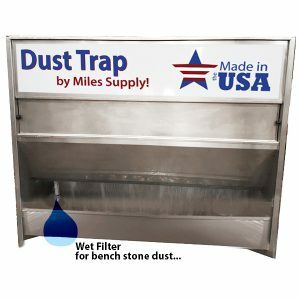 Wet filter for bench stone dust. See Dust Trap flyer. The Miles Supply Dust Trap collects dust through a water curtain. The dust collector creates a wall of water through a recycling sump pump. Two motor fans create a suction that pulls the dust particles through the water to settle on the bottom of the unit. Nozzles in the spray bars are uniquely designed to stay clean. An optional shroud extends sides and roof to make better suction. • Empty the tank and sprayed out the sludge with a hose. • Fill water back to the required levels. • Rinse and clean the aspiration filters; take out and spray with light water pressure. Overall size of the unit: 103 x 84 x 28 inches.